Is it Safe to Burn Candles in a Fireplace? Lighting candles in a fireplace is a stylish way to add the ambiance of soft, glowing fire to your home without the hassle of burning treated wood or messing with complicated outdoor charcoal fireplace starters. Candles are safe to burn in a fireplace – if it's the correct type of fireplace. Gas fireplaces that use pilot lights and artificial logs shouldn't use candles. Take safety precautions before lighting your candles in a fireplace. Can a Candle Cause a Fire? Lighting any type of fire in the home always carries a certain amount of risk. Candles are no exception. An unattended candle can be knocked over and its small flame can quickly grow into a large fire. Since you'll be using the candles in the fireplace, the first thing to do is to make sure there's nothing in the fireplace that could still catch on fire and spread. Clear the fireplace of any debris. Burning newspaper in the fireplace or burning treated wood in the fireplace are excellent ways to start a fire but are hazards if any remain in the space when lighting candles. 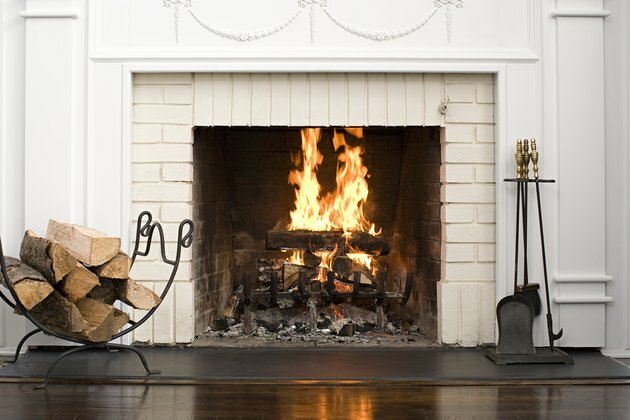 Consider having a professional come in to clean your hearth and chimney to prevent accidents. Removing anything that could catch on your burning candles in the fireplace will allow you to create a safe space for a relaxing ambiance. Don't leave candles burning unattended. Don't burn a candle on or near anything that can catch on fire. Always keep candles out of reach of children and pets. Most fireplaces will be at eye-level for small children, dogs and cats. They'll be less intimidated by the small flames and are more likely to investigate them. This poses a risk of injury for children and pets as well as increasing the likelihood of accidental fire spread. If you have a glass door or shield for the front of the fireplace, keep it closed as the candles burn. This blocks the candles from reach, and it also helps in case a chimney draft fans the flames. Before lighting your candles, make sure that the wicks are trimmed so the flames don't become too large. If the flames become very elongated and yellow, the wicks need trimming. Trim candle wicks one-fourth of an inch with scissors or a wick trimmer before burning. Always use the right sized candleholder for the candle – don't go too small. Even if you're burning pillar or votive candles, set them on a candle holder or a candelabra to keep them from toppling over while they're lit. Don't let the candles burn all the way down; extinguish when the candle has 2 inches left in a candleholder or half an inch in a container. Make sure your candles are placed at least 3 inches apart. This gives them space to "breath" and reduces the risk of overheating. The spacing also allows for artful arrangements; place taller candles toward the back of the fireplace (in appropriate-sized holders) shining above shorter, smaller candles closer to the front. Wood stoves are both functional and aesthetically pleasing for a fire but aren't the place for candles. As mentioned above, the fireplace must be completely clean of debris and flammables before the candles can be placed inside. Wood stoves may contain a buildup of creosote, a liquid or tar-like combustible substance that can linger in the chimney or stove pipe. Even if all wood and paper are removed from the stove, creosote may still catch on fire from the candle, creating a safety hazard.